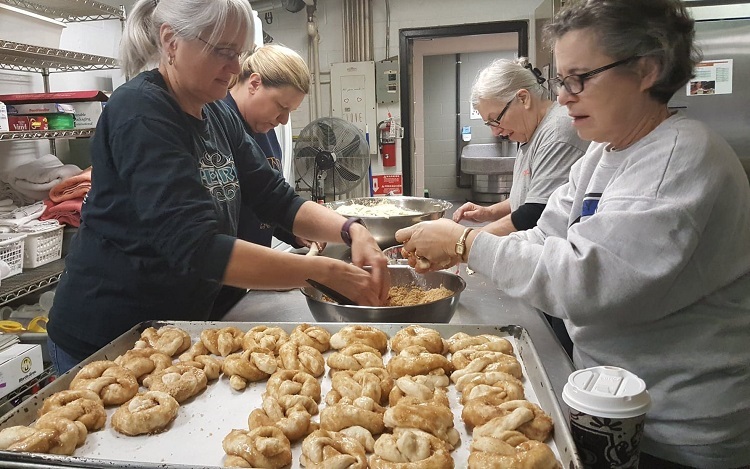 Regina Guild volunteers, from left, Pam Lamont, Trish Roberts, Maureen Becker and Monica Peitz started their BRR day about 4 a.m. Saturday by baking 30 sheets of St. Pat's cinnamon rolls. 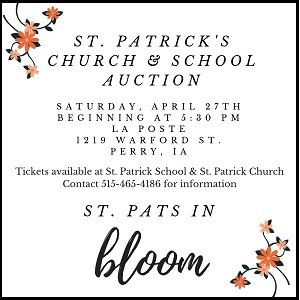 Perry Lion Gary Becker gathered the fixings for the Perry Lions Club egg casserole breakfast. 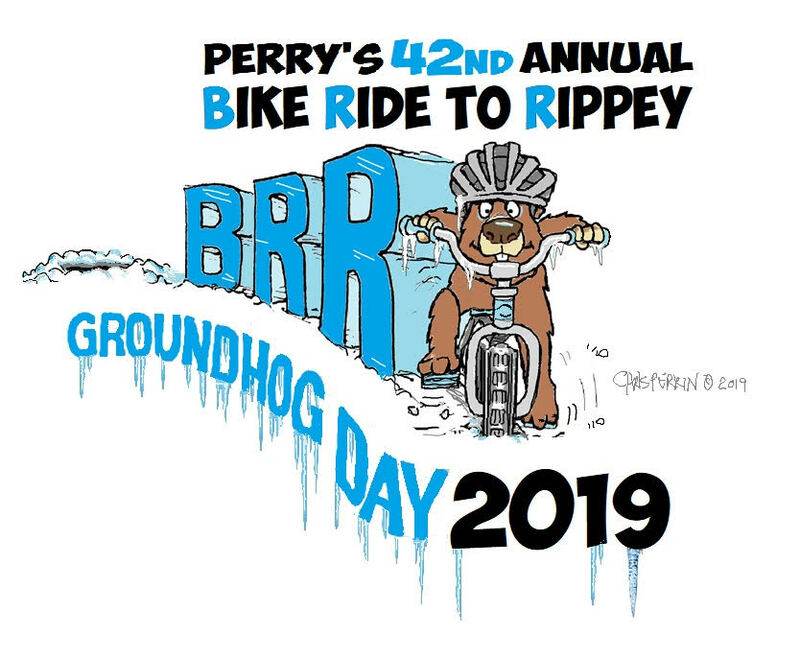 Staff members with the Perry Public Works Department prepared the grounds along the Willis Avenue boulevard for the influx of BRR riders. 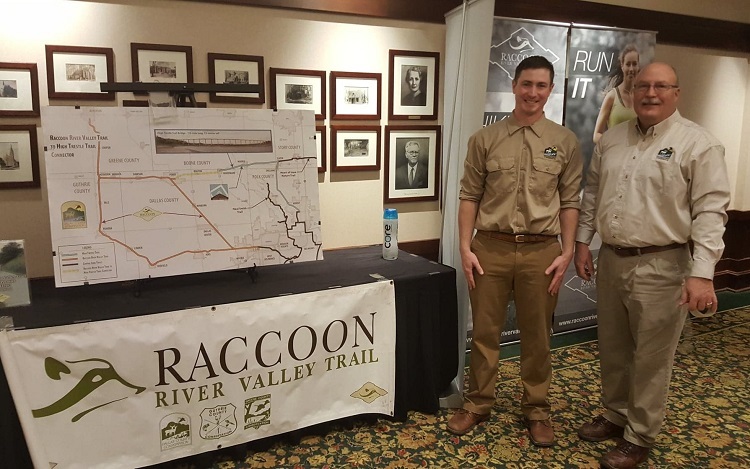 Dallas County Conservation Natural Resource Manager Curt Cable, left, and Executive Director Mike Wallace prepared to display the steady progress of the Let's Connect connector trail and the Raccoon River Valley Trail to BRR riders. 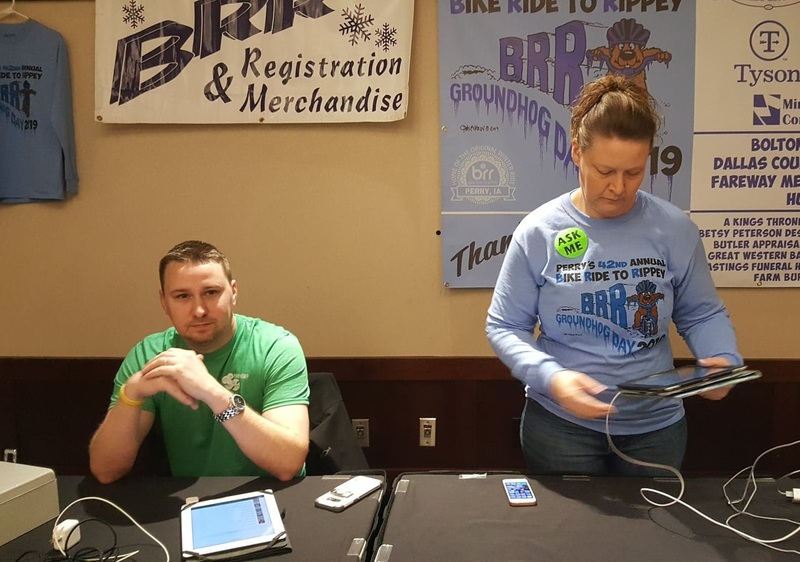 Staffing the BRR registration and merchandise tables were Optimist Club President Zack Cregeen, left, and Optimist Misty Von Behren. 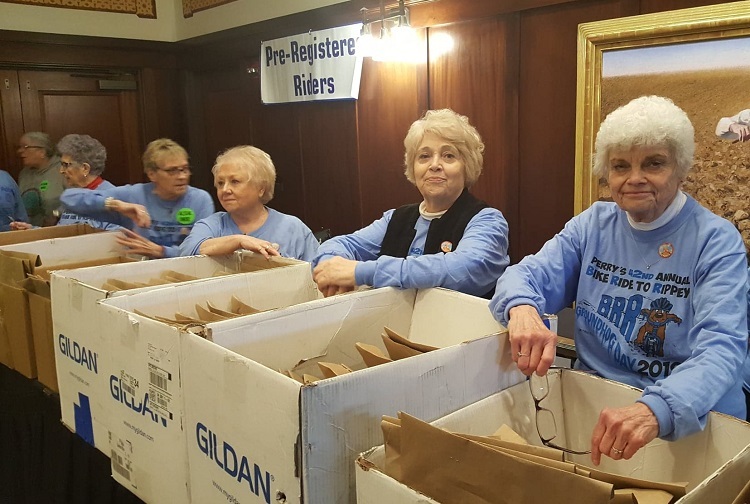 Members of the Gamma Delta chapter of Beta Sigma Phi, from left, Mary Lou Stromquist, Connie McGuire, Becky Shelker, Marti Klatt and Sue Leslie, checked in the pre-registered BRR riders, a duty the chapter has discharged for many years of BRR Rides. 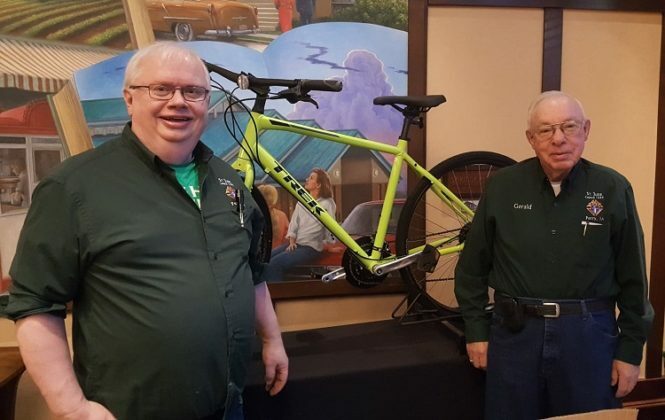 Knights of Columbus John Wilson, left, and Gerald Palmer prepared to draw the winning raffle ticket for a Trek bicycle. 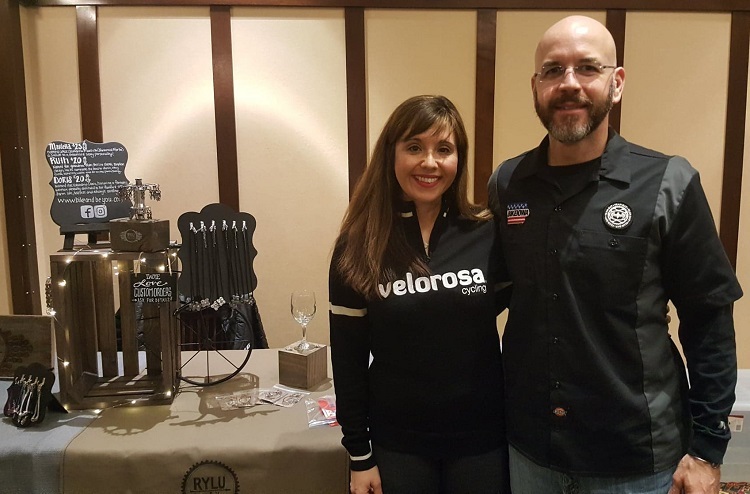 Among the BRR vendors in the Spring Valley Ballroon of the Hotel Pattee were Rylu Bike and Be You of Urbandale. 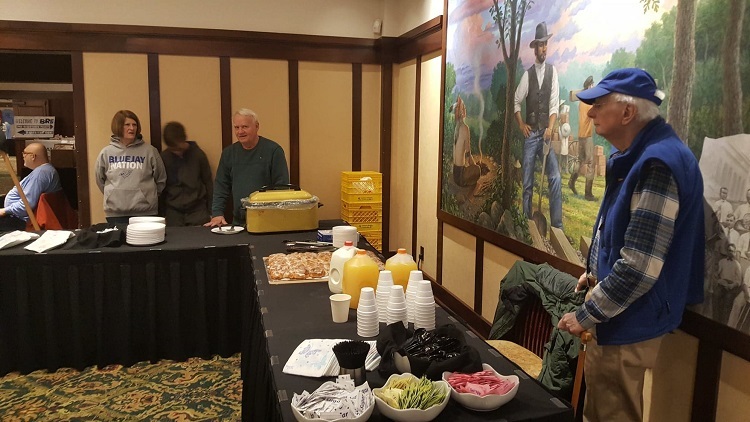 Perry Lion Andrew Bambrick, right, muses while awaiting the BRR breakfast crowd. 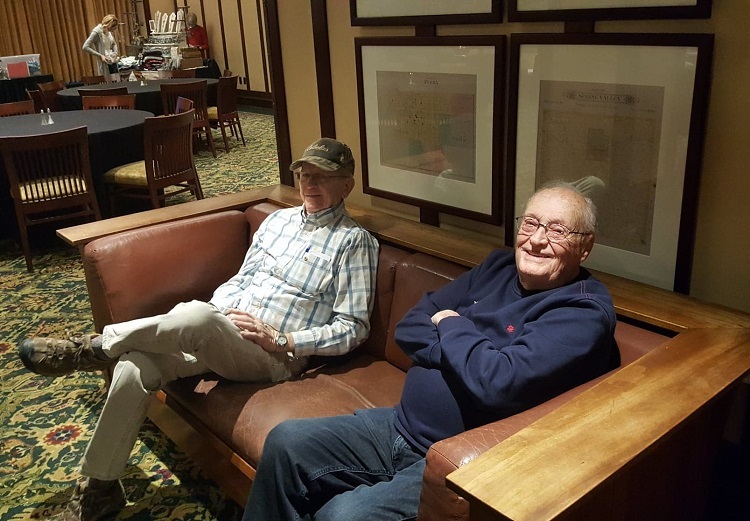 American Discovery Trail promoter Butch Niebuhr, left, and Perry Lion Lou Hoger await the crwod of BRR riders in the Spring Valley Ballroom of the Hotel Pattee. 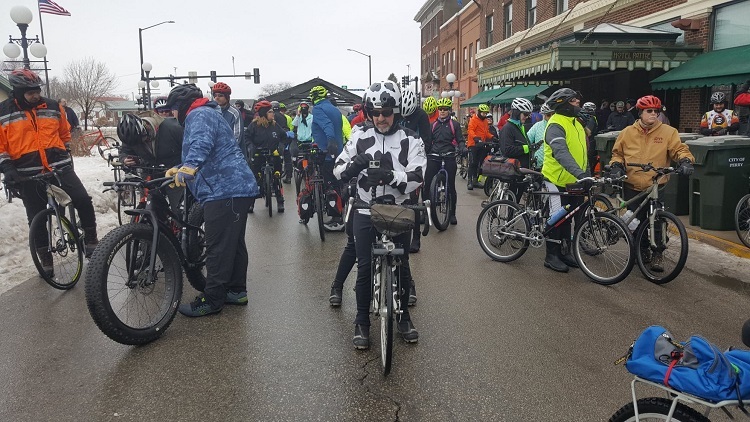 Outside the Hotel Pattee, many hundreds of bicyclists gathered for the start of the 42nd annual Brr Bike Ride to Rippey. BRR Ride sponsors Lynsi Pasutti of the Perry Chamber of Commerce, center, and Tom Maxwell of the Hotel Pattee, right, announce the official start of the 42nd annual BRR Bike Ride to Rippey. 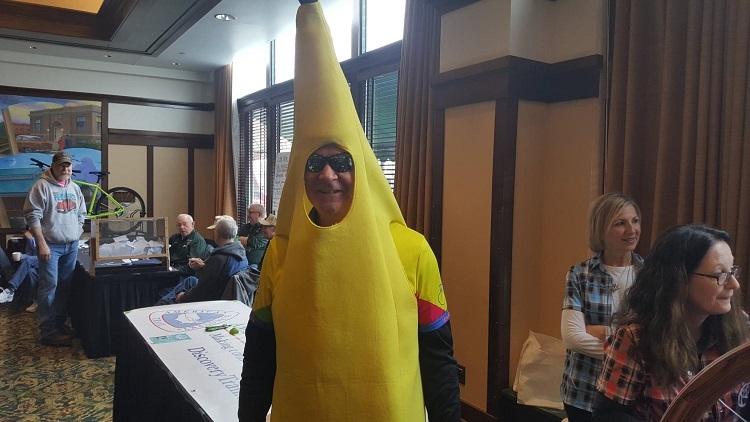 Banana Man also known as Mike Knox was ripe for the BRR ride. 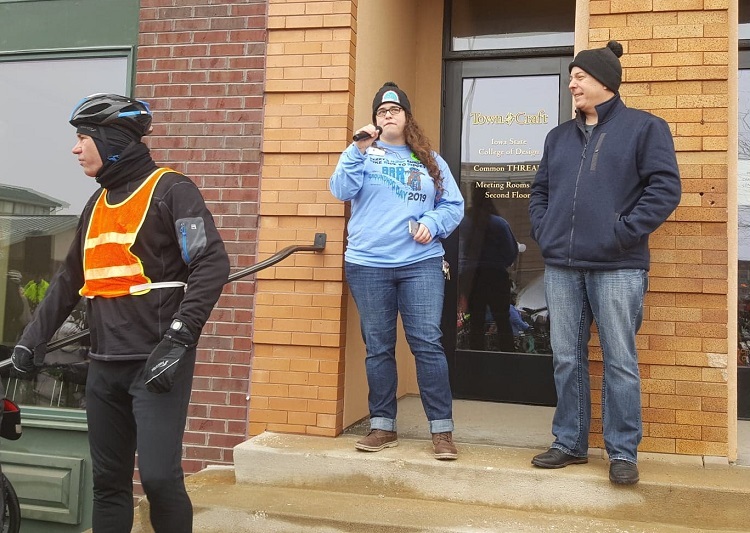 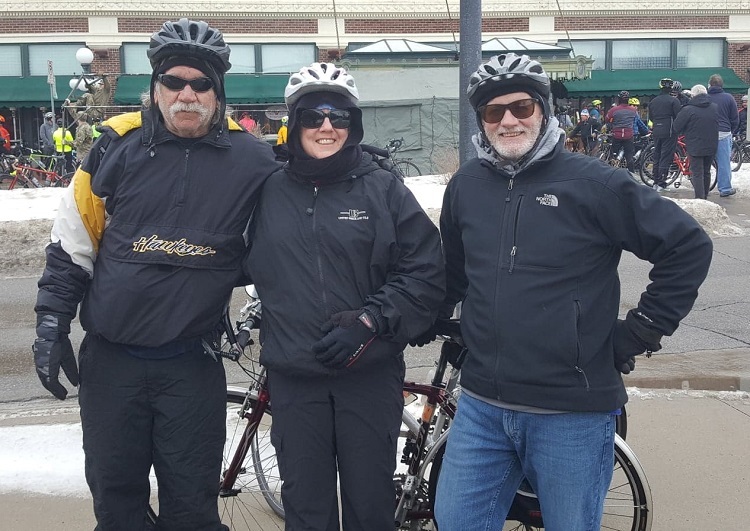 Longtime BRR riders, from left, Larry Fiori of Ogden and Diane Caufield and Mike Caufield of Dallas Center welcomed the milder temperatures after the mid-week's arctic blast. 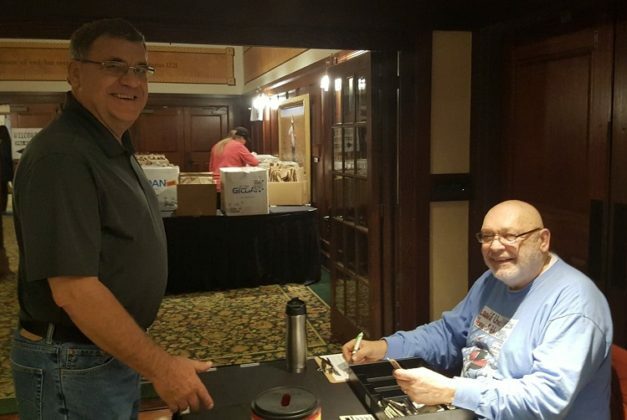 Comfortable on the leather couch, Bob Roeder, left, and Don Strassburg welcomed riders and guests to the BRR Ride Saturday morning at the Hotel Pattee. 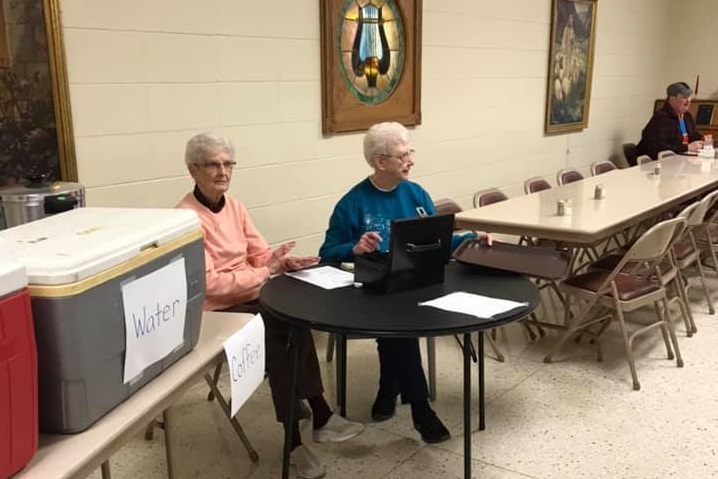 Church ladies kept proceedings orderly at the Rippey United Methodist Church for Saturday's BRR Ride. 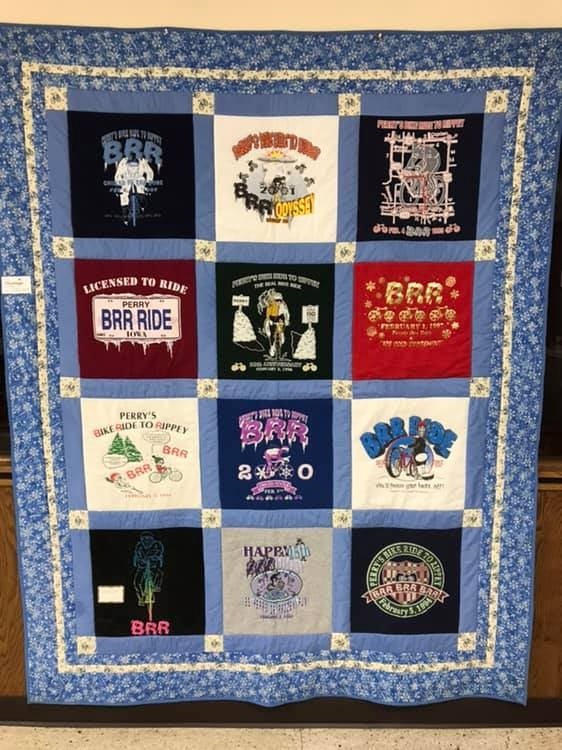 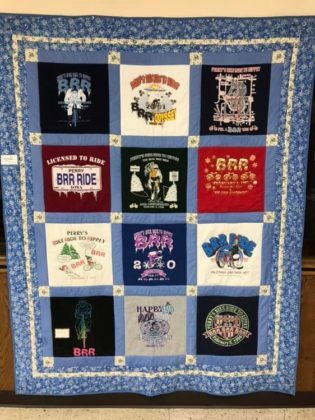 Memories of BRRs gone by were captured in an award-winning quilt. 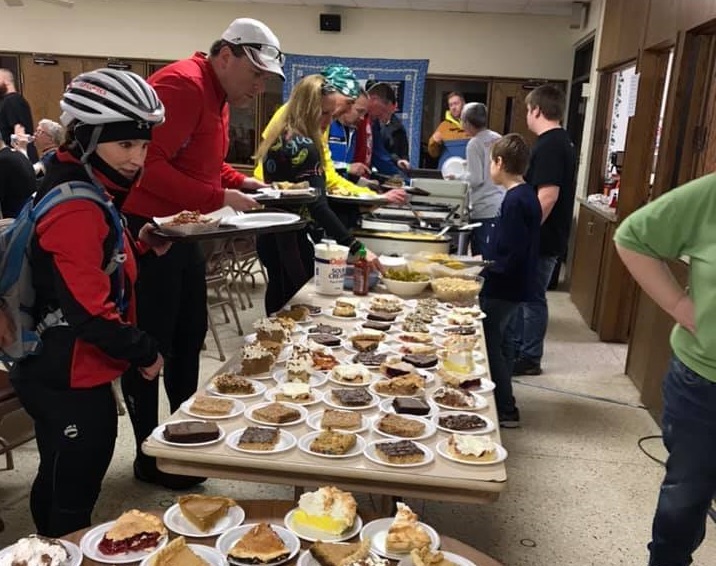 Many riders' eyes were as wide as pies when surveying the goodies at the Rippey United Methodist Church. 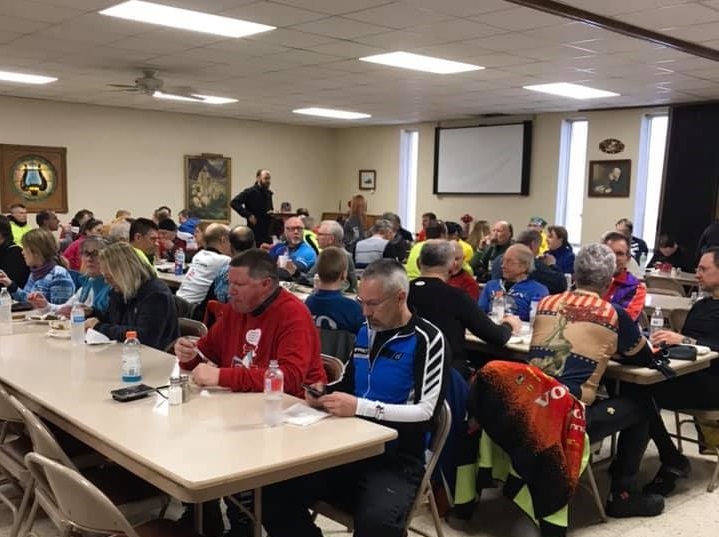 BRR riders filled the Rippey United Methodist Church Saturday to fortify themselves at the halfway mark. 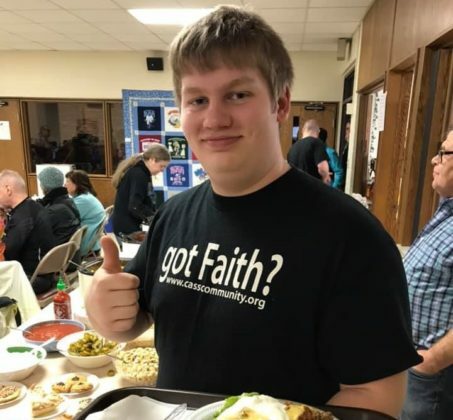 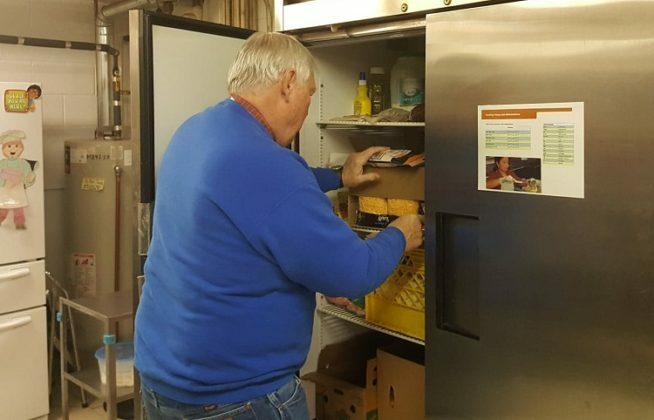 Faith and food were in plentiful supply at the Rippey United Methodist Church at Saturday's BRR Ride. 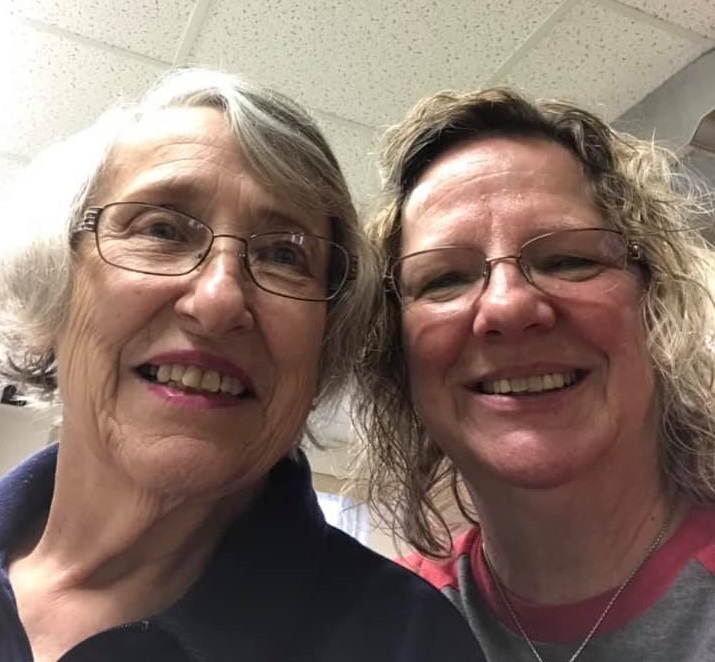 Connie Neece, left, and Mary Hick were among the many Greene County stalwarts on hand in Rippey. 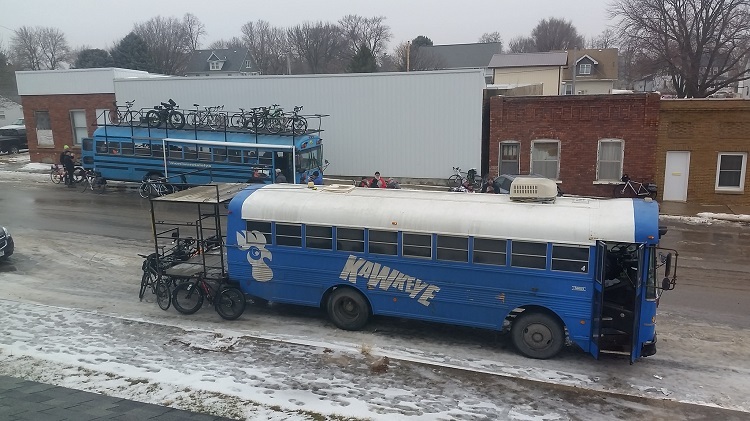 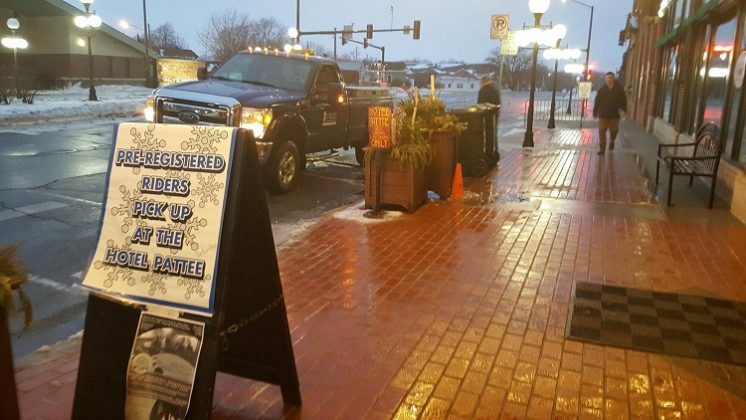 Wet roads, southerly winds and a temperature of 43 degrees met the bicyclists at the 10 a.m. start of the 42nd annual BRR Bike Ride to Rippey Saturday in downtown Perry. 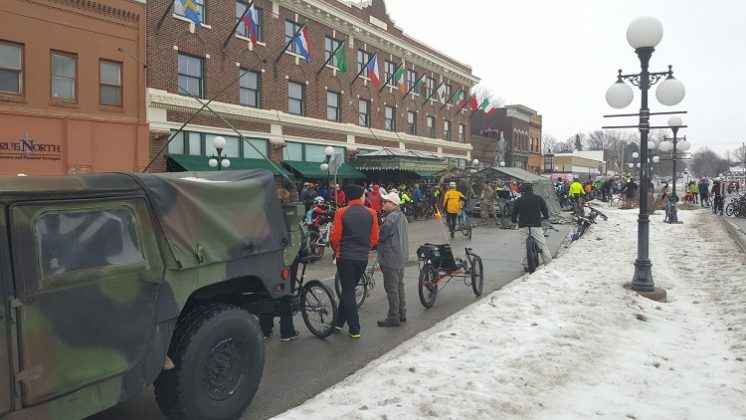 With more then 500 pre-registered riders and several hundred day-of entrants, the annual endurance ride drew visitors from 10 states outside Iowa. 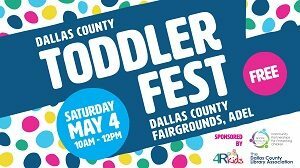 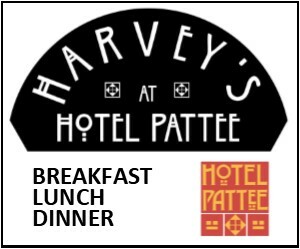 The after-party continues until 6 p.m. with the Lil Red and the Medicated Moose Band playing at the Hotel Pattee, 1112 Willis Ave.